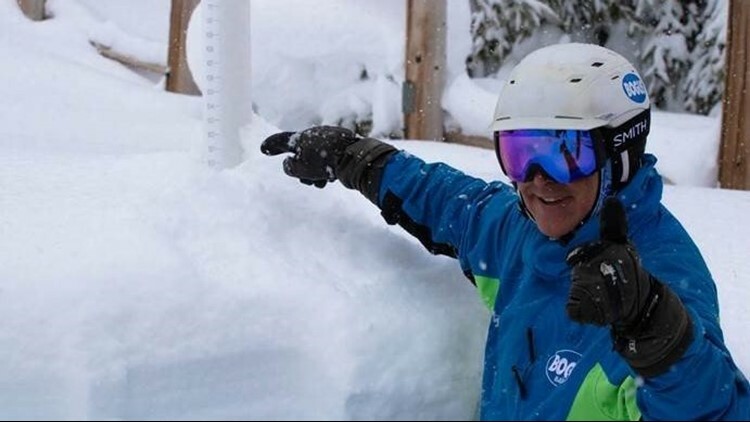 Bogus Basin general manager Brad Wilson points to a measuring stick showing 100 inches of snow in the base area. The last time Bogus measured 100 inches of snow in the base area was 1940. BOISE, Idaho — All the recent snowfall in the Idaho mountains has ski resorts cheering, and skiers and snowboarders enjoying lots of fresh powder. Bogus Basin this week reached a milestone the mountain recreation area hasn't seen in almost 80 years: 100 inches of snow in the base area. To celebrate, Bogus is hosting a "FebruBURIED" party on Saturday, March 2, from 11 a.m. to 3:30 p.m. The bash will include music, and opportunities to win free custom "FebruBuried" t-shirts and Bogus Bucks gift cards. 10 Barrel Brewing Company will be there serving up brews to thirsty skiers and snowboarders from their "Beer Cat." The recreation area received more than 11 feet of snow in February, helping to boost Bogus' annual season pass sale, officials said.